It’s supposed to ensure equality of need in Northern Ireland, but a new report accuses the Equality Commission of allowing the promotion of good relations between the two main communities to undermine the rights of minorities. A report to be published tomorrow (Tuesday) by the Committee on the Administration of Justice (CAJ) suggests that the Equality Commission for Northern Ireland (ECNI) has come to place more emphasis on good relations – the policy of maintaining peace – at the expense of promoting equality, especially in the areas of the Irish language and public housing, such as the controversial handling of the former Girdwood army site in North Belfast. In contrast the report, ‘Unequal Relations’, concludes that a different approach has been taken to the flying of the Union flag, in which it says the commission has failed to place the same priority for good relations between the two communities. In response the Equality Commission said it was “disappointed” by the CAJ report. “We have provided extensive material to the author and provided commentary to address inaccuracies and misunderstandings throughout the time of its preparation. The published paper, in our view, has unfortunately not developed beyond the expression of opinion, which in many places is set out as fact,” a spokesman said. The CAJ’s criticism of the ECNI comes at a critical moment in the debate on equality and good relations in Northern Ireland, with behind-the-scenes discussions going on over realising the vision of a shared future here – the outcome of which will be decided at the end of the year. In May 2013 the Office of First and Deputy First Ministers (OFMDFM) launched their ‘Together: Building a United Community Strategy’ document as a vision of the way forward for Northern Ireland. A key part of the strategy is aimed at enhancing the existing powers of the ECNI to include increased statutory oversight of equality and good relations legislation. The term ‘good relations’ is used 179 times in the strategy document – but crucially it fails to provide any definition for the term. 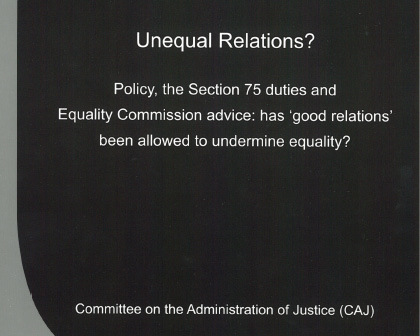 The strategy’s proposed increase in powers for the ECNI prompted the CAJ to publish the long-standing concerns it has that existing ‘good relations’ legislation is already undermining equality – even though equality is supposed to have primacy here. In 1998 Section 75 of the Northern Ireland Act, the implementation legislation for the Good Friday Agreement gave the commission powers to oversee equality and good relations in policies drawn up by public bodies. In particular, Section 75 was designed to ensure that the equality legislation should always take precedence over good relations. 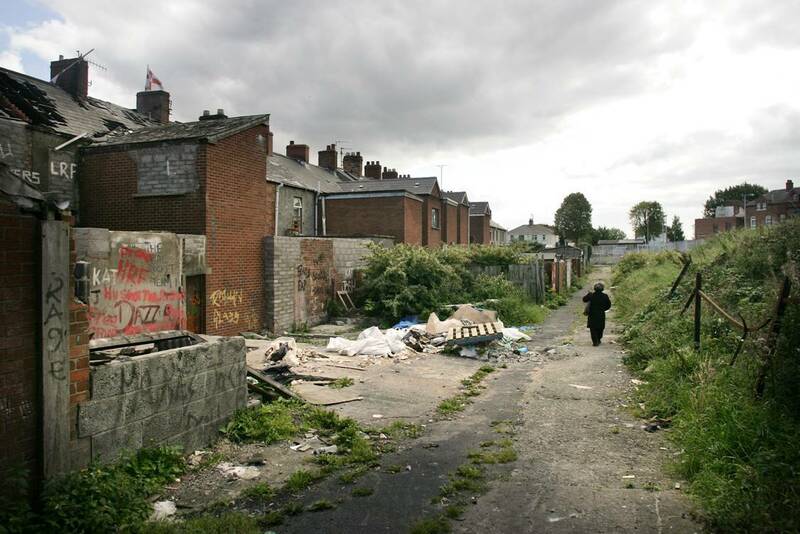 This was aimed at preventing inequality in public policy, such as the continued neglect of housing in poor areas on the grounds that improvements would create tensions between the two communities. However, while in principle equality has primacy in the legislation; the report claims there have been significant examples of the commission placing good relations above equality. As part of the Section 75 requirement of the Agreement, public bodies are obliged to undertake Equality Impact Assessments (EQIAs) on all proposals to ensure they comply with equality legislation. However in 2007 the ECNI announced a major policy shift when it decided that public bodies should also now carry out EQIAs to ensure that proposals did not unfairly impact on good relations as well equality issues. The report states that the commission’s decision to compel public bodies to carry out EQIA’s to ensure they did not impact on good relations created a situation which could place a “simple negative perception” of the potential for damage to community relations against actual need. “This would include the scenario… whereby a positive action measure for a disadvantaged minority is objected to by a majority group with greater political clout, and the measure is therefore considered an ‘adverse impact’ on good relations and not proceeded with,” it states. The report also reflects that the Good Friday Agreement failed to explicitly deal with the issue of flags and, as a result, the display of national flags remains a heavily contentious issue. Nationalists interpreted commitments in the Agreement for ’parity of esteem’ as providing for a ‘two flags’ or ‘no flags’ policy, it states. In contrast, unionists believed that the agreement kept Northern Ireland within the UK and as a result argued only one flag should be flown to indicate constitutional status. The report claims the commission has not considered parity of esteem as part of good relations, claiming it sticks to equality law rather than good relations in its advice on flags. It claims that ECNI advice is inconsistent as to which flag policies constitute adverse impacts on the two communities. However the report states the commission appears to have taken a position on the impact of the Irish language on community relations – and in a way which limits support for the language in public life. 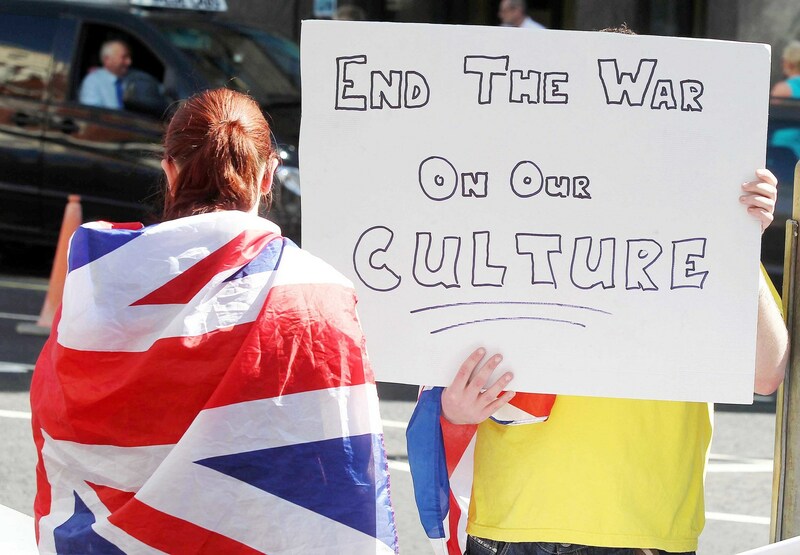 The report states that the Council of Europe’s Framework Convention for National Minorities (FCNM) has found evidence that public bodies have used a supposed need to maintain good relations between the two communities as justification for refusing to erect bilingual signs. It also says that the Committee of Experts (COMEX), which monitors state members’ compliance with the European Charter for Regional and Minority Languages for the Council of Europe, raised concerns that “inappropriate claims for parity of treatment between Irish and Ulster Scots” has led to incidents of funding or other initiatives for Irish being refused on the basis that it was not possible to reciprocate for Ulster-Scots. COMEX said it had heard claims that support for Irish should be frozen until Ulster Scots had reached the same level of development. The CAJ report found that good relations considerations were prominent in the commission’s EQIA advice on Irish, with a publicly stated policy that good relations were “an important factor” in relation to Irish language policies. “Within the advice on flying the Union flag the good relations duty is rarely mentioned. It concluded: “There are significant differences in this approach and that taken in relation to policies promoting the Irish language where adverse impacts are routinely determined. The report states that on a number of occasions EQIA advice given by the commission to public agencies concluded that ‘objective need-based’ policies constituted an ‘adverse impact’. The commission advised the public bodies involved to pursue alternative policies in such cases. The commission is on record as saying it does not regard its role as to assess what is an adverse impact, but instead it views its role as advising public authorities how they must respond when one has been identified. However the report said this contradicted the behaviour of the commission in specific instances such as when Derry City Council proposed changing the official name of the city from Londonderry to Derry. The commission warned that the move would constitute a “serious adverse impact” despite the public authority not having reached that conclusion. At the time the commission said: “Policy-making should not simply be about reflecting the wishes of the majority. An EQIA is not a tool which was designed to ensure that the wishes of the majority prevail”. This, the CAJ claims, has left the commission open to charges of inconsistency as such principles do not appear to have been applied to other minority issues, including the rights of Irish speakers. The report is also highly critical of the commission’s handling of housing and regeneration in the advice it has given in recent cases. CAJ says the commission has a clear requirement to ensure that equality legislation takes primacy over good relations in this highly-contentious area. The Participation and Practice of Rights (PPR) project have published a number of damning documents on the lack proper social housing in north Belfast. CAJ reaffirms this by saying there has been a lack of ECNI research on housing inequality; instead the strategic emphasis of the organisation has placed on tackling segregation. Earlier this year a Community Relations Council (CRC) report found that Catholics continued to experience much greater socio-economic disadvantage than their Protestant counterparts, particularly in housing. But in 2011 Social Development Minister Nelson McCausland controversially overturned a decision to build 200 homes on the site of the former Girdwood army base, most of which would have been allocated to Catholics on the basis of objective need. Mr McCausland cited a prerequisite of cross-community agreement as justification of his decision to block the housing development. The report said there was evidence that the commission’s emphasis on tackling segregation and a lack of reference to housing inequality in the organisation’s ‘Statement of Key Inequalities’ policy document, was being used by public authorities to justify decisions to favour good relations over equality issues. The report also found evidence of the ECNI working to build support from unionist parties for its own work. This was despite a survey commissioned by ECNI which concluded that there was no difference between communities’ support for the commission, the report stated. The CAJ report said that when challenged about setting such a target on the grounds that it could risk influencing policy positions, the commission insisted that the target related to increased engagement with the unionist community rather than policy positions. The report concludes that inequality between the two main communities remains a politically contested area. Raising Catholic disadvantage can still be regarded as a ‘taboo’ subject, best avoided to prevent appearances of being ‘divisive’, it said. It added that such an approach effectively involved maintaining good relations over and above addressing inequality. “It appears less contentious to publicly and rightly raise areas of comparative Protestant disadvantage, which from a good relations perspective could be seen as a method to court greater buy-in to the equality agenda from political unionism. “Such an approach would become problematic however if it is also predicated on playing down or overlooking Catholic disadvantage. “In such a political context it is all the more important to have a robust and independent equality body to conduct research and objectively put forward the equality case.